Information on street changes and renumberings can be found in a variety of places and is often needed for census and other research work. Contacting locals familiar with the area is a good place to start, including local libraries, genealogical societies, historical societies, etc. This list of street changes came from maps of Davenport, Iowa, included in a plat book for Scott County, Iowa. 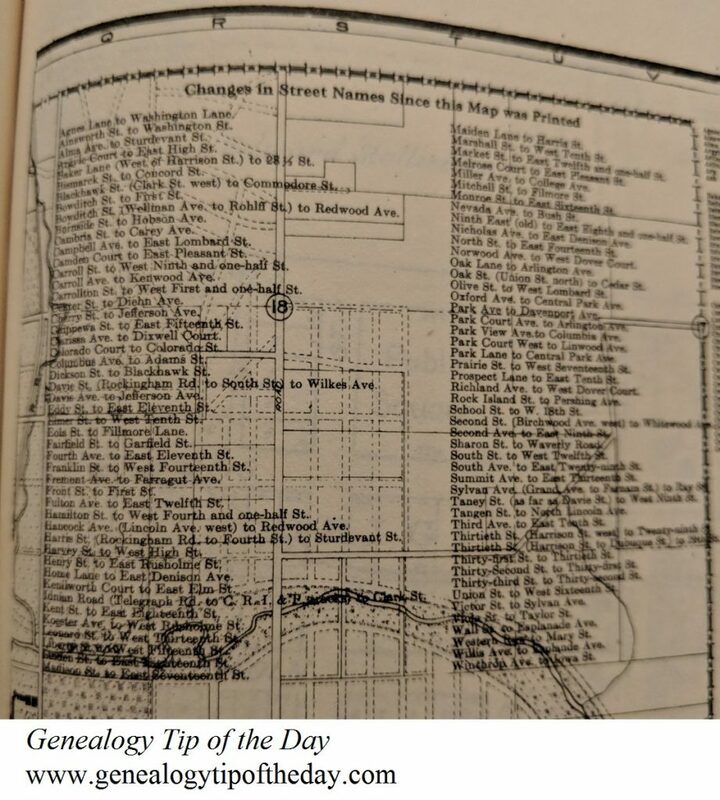 City directories can help if you know the current name of a street but need the former name. I have found that by looking in older directories, I could find the previous name of the street written in parentheses after the current name, in the directory a year or so after the name change. We’ve had a lot of name changes in Daytona Beach, some of them changed to honor early auto racers on the beach. So for example, we have Segrave St. (1st St.) I’ve also seen this on Sanborn maps. I need to look at our plat maps to see what they say! Sanborn maps are another great tool to find these as well. Thanks for the reminder! And if you don’t live close enough to drive through the old streets, you can always use Google Earth maps to see what is at that address now. It’s such fun. If the house is still in existence, using current real estate listings and property tax listings you can get a glimpse into the interiors! Be wary of the information though, the house I lived in all through the ’50’s was listed on the tax roll as having been built in 1964! You can also get a picture of how the neighborhood has changed as well.